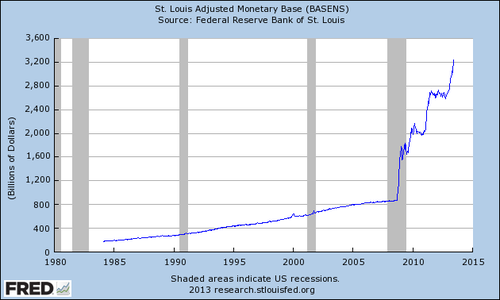 Vast, Highly Accommodative $2.6+ trillion Quantitative Easing (QE) to End? When looking at the massively exploded $3.41 trillion US Fed balance sheet as of June 2013, one can easily forget that in about 100 years, the Fed only printed $800+billion up until March 2008. [See Federal Reserve chart] Now the Fed balance sheet stands at more than four times the initial figure: most of it is outstanding debt and not all of it is high grade. What are the real long term consequences of this financial DNA-altering experiment, with all manner of impurities added, and are we just about to read the opening verse in the first chapter via the financial markets? What are those swiftly rising interest rates in the long term -- as measured on ten year and thirty year government bonds -- really stating? In numbers, are they suggesting that inflation could steadily ratchet upwards and begin to go out of control? Ultimately, all fiat currency can become a license-to-thrill, a play on national debt, and a confidence trick. In this case it has been levitated, contrary to popular opinion, via massive QE. What happens if confidence evaporates when massive QE is switched off? We may witness not just equity markets volatility but currency and bond markets volatility simultaneously. It is not easy to give up on such a massive drug addiction without severe withdrawal symptoms including violent trembling, severe pain and suffering. Note, if extreme volatility carries on, it can become synonymous with further confidence and structural corrosion. All this means in a nutshell is that QE could carry on for a lot longer than originally envisaged until the bond market volatility puts an end to it. When it is eventually switched off, beware the consequences. It is a colossal elephant in the room getting $85 billion larger every month and nobody is really looking at the Fed's balance sheet whose humongous size has crossed $3.41 trillion and is still rising! Is it now time to 'stress test' the Fed, the ultimate large cap financial institution, before it is too late?